This is the story of a wish granted. Dignity Housing’s mission is to break the cycle of homelessness and poverty that confronts low-income families and individuals in the City of Philadelphia. Dignity Housing breaks the cycle of homelessness by providing quality transitional and permanent supportive housing, promoting self-sufficiency, and creating opportunities. Since the beginning and continuing to this day, Dignity focuses on helping homeless families and individuals stabilize their lives, move toward self-sufficiency, and find permanent homes. Dignity does this by creating services that are individualized for each resident and their family. Every resident is assigned a case manager who provides guidance, encouragement and connection to resources that help families and individuals achieve their goals. Dignity Housing has 24 units of transitional housing – 22 are for households with children and 2 are for single adults. In these programs, families and individuals stay with Dignity for 12 – 18 months, working on addressing trauma, learning to cope with daily living, enhancing job skills, and advancing education. In our Permanent Supportive Housing program, Dignity has 34 units of housing for individuals and families. Residents in this program include single men, women, and families with disabilities including chronic homelessness, dual diagnoses (substance addiction and mental health), physical disabilities, or HIV-AIDS. 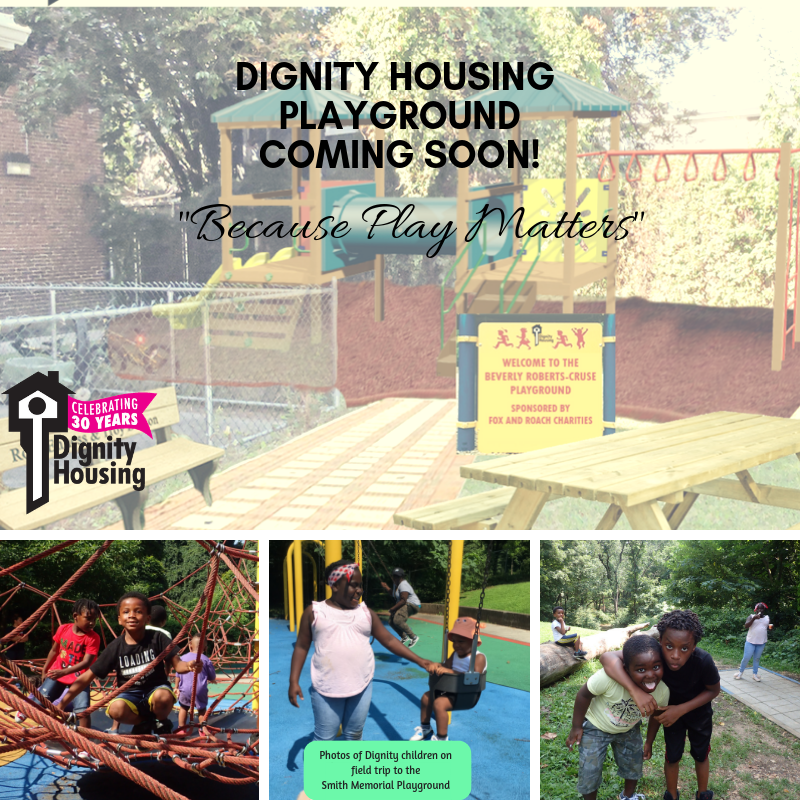 For the children, Dignity offers an After School Enrichment Program, and we are ecstatic to announce that this spring, we will be breaking ground for Beverly’s Playground, honoring former Executive Director Beverly Roberts-Cruse. Our children will have a place to play steps away from their front door that is safe and secure. This summer, we wrote to the Wish Wall Foundation asking for help to enhance the playground site. We are so thankful to Simonetta and the Wish Wall Foundation for fulfilling our wish! They will be gifting us an Amish-made, top quality picnic table. The table will be a place of shared meals and conversations for many years to come. The Wish Wall Foundation has supported Dignity Housing before, gifting “Hope Chests” to the teenage girls residing with their families at Dignity. The hope chests were filled with items to help make their teenage years a little easier such as headphones, journals, snacks, books, and toiletries. The Wish Wall Foundation makes sure the young men and women at Dignity Housing know they are not forgotten.